I've recently read two books that were written by women living with a facial difference. As the parent of a craniofacial child, I enjoyed the first-hand perspectives these authors so bravely shared. Both authors have lived with their facial difference since birth, and these were first books for both women. 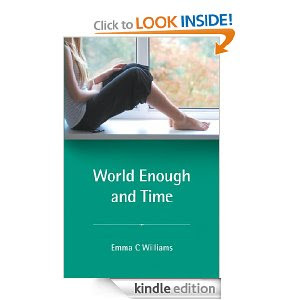 Emma C. Williams wrote her debut novel in a fictional format for young adults. The story is about a teen girl coming of age and living with a chronic and physically noticeable difference. Williams says that she chose to write for young people because they are "at the time of their life when books had the most profound effect on her own." She has Goldenhar Syndrome and grew up experiencing what our own CCA Kids deal with throughout their lives: clinic appointments, surgeries, stares, missing school, and insecurity over their appearance. I loved the insights this book provided from Anna, the main character's, perspective. For example, what it's really like to be poked and prodded by a bunch of medical students when you are a teenage girl half unclothed in an exam room. Or, when dating, how you wrestle with judging someone else by their physical attraction when you live with a noticeable difference yourself. Is that too hypocritical? Anna's best friend is compassionate but also remarkably honest when necessary, which provides for some intriguing conversations about acceptance from the viewpoints of teenage girls. This is a wonderful story that, to my knowledge, has never been available for CCA teen girls. Overall, the book is an easy read that is reminiscent of a Judy Blume book with a touch of Wonder by R.J. Palacio. I recommend that a parent read the book first to make sure it is age appropriate (ages 13+ would be my recommendation). I think the story offers great opportunities for CCA mother/daughter conversations about difficult topics like dating, self esteem, growing up, surgery/medical decisions, and the fears of being alone. If you are a CCA parent with a daughter in the 13+ age range, I highly recommend checking it out. For more information about Emma C. Williams, you can visit her website where she also blogs as Anna Jones who is the fictional character from the book. "One woman's transformational journey from craving acceptance to accepting herself"
Dawn Shaw was born with a fast-growing tumor on her face that had to be removed shortly after birth. Removing the tumor leaves one side of her face paralyzed and disfigured despite numerous attempts at reconstruction. Facing Up to It is her autobiography from birth to adult-- including some topics that parents should preview before giving it to their teenager or young adult. The book would benefit from some editing as some parts toward the end go on a bit too long. Nevertheless, I enjoyed Dawn's story and admire her courage to so openly share all the "skeletons in her closet". Any parent of a child living with a facial difference, especially a teen or young adult, will find words of wisdom and helpful insights that can only come from such first-hand experience. 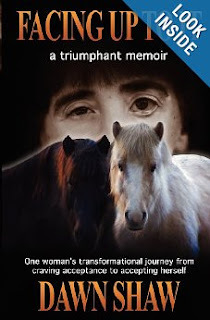 For more information about the book and Dawn Shaw, you can visit her website at Facing Up to It. One theme I appreciated from both of these authors is the positive and empowering impact their parents made in helping them to become successful adults. Although the Emma C Williams book is fiction, I'm taking a leap that the parenting aspects of the story (as well as other parts) are somewhat autobiographical. It is refreshing to see people with facial differences making such powerful contributions to the world of literature, which I believe helps to bring about increased awareness and acceptance-- something we can all benefit from!